I’m happy to report that the online book club started last month has been going very well! We had a rough start, as the forum I had initially created for the book club resulted in technical glitch after technical glitch. We eventually moved the forum to Goodreads, after which things took off! Phew! The book club has been renamed Paged: A Book Club (see widget on the right of your computer screen), and currently has 8 very active members. Official discussion of the June book (The Lost Summer of Louisa May Alcott by Kelly O’Connor McNees) begins July 1st, but we’ve had a lot of fun discussing it (sans spoilers) along the way. The book is a fairly fast read, so feel free to join if you haven’t yet—you still have over 3 weeks to get it read! Join the book club HERE. Or, perhaps you’d rather wait and sign on for the July book. You can do that too! Meghan earned the right to pick the July book, as she was the very first person to join the book club. 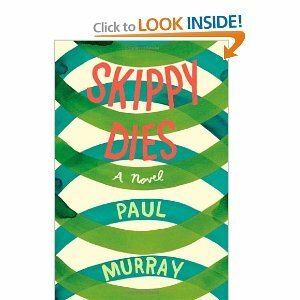 She has selected Skippy Dies by Paul Murray. The premise is that Skippy, well, dies at an all-boys school in Dublin. Darkly humorous (which has “Meghan” written all over it), the book has received mostly positive reviews. I, for one, am very excited about the July selection, and I’m really looking forward to reading it. Best of all? I don’t think this is a book that I would have unearthed on my own. See? This is part of what makes book clubs so nifty. So, then: Skippy Dies. Official discussion starts August 1st; reading starts now!